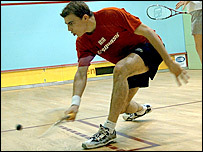 Nick Matthew and Tania Bailey won their first British National Squash titles in Manchester on Sunday. Fourth seed Matthew had to dig deep to overcome three-time winner Lee Beachill 11-9 6-11 11-9 10-12 12-10 in the longest match of the tournament. "I've made a habit of reaching finals and losing, but I really wanted to win this," said Matthew. Meanwhile, Bailey saw off top seed Linda Elriani 9-7 6-9 9-6 9-3 in the first ever meeting between the pair. "I knew I was playing well," said Bailey. "I had some good results in the last year, but I never seem to manage to win anything. I thought I had a good chance here, but to actually win it is something else." Matthew said that luck had played its part in his victory. "Every time I thought that Lee had gone, he would just come back again and again," he said. "I got about nine lucky nicks to his three, which probably made the difference in the end. "As well as my coaches, my parents, my supporters and everyone else, I want to thank my granddad, who has supported me throughout everything. He would have been here but he's in hospital."